In past generations, the brand names were always the same in the luxury sedan class – BMW, Mercedes-Benz, and Audi. Those days are in the past with the emergence of the English-based Jaguar brand. If you are looking for premium luxury in the small luxury sedan class, look no further than the 2018 Jaguar XE. The perfect combination of luxury and performance, drivers have come to love the Jaguar XE. Learn more about the Jaguar XE with this 2018 Jaguar XE vs 2018 Mercedes-Benz C-Class comparison. A lightweight, aluminum platform promises perfect balance when you get behind the wheel of the 2018 Jaguar XE. When paired with an athletic style and power-packed engine options, the Jaguar XE delivers on all counts. Available in six basic trim levels – XE, Premium, Prestige, Portfolio, R-Sport and S – the Jaguar XE can be tailored to fit your specifications and at an affordable price. What Are the Differences Between the Jaguar XE and Mercedes-Benz C-Class? Are you looking for a luxury sedan that possesses an affordable price tag? 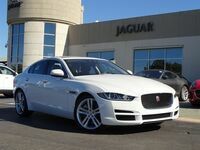 You will find what you are looking for in this 2018 Jaguar XE vs 2018 Mercedes-Benz C-Class comparison at Barrett Jaguar. With a price tag that starts at just $35,725, the Jaguar XE is a much more affordable option than the Mercedes Benz C-Class priced at $40,250. In addition to a more affordable price tag, the Jaguar XE promises superior performance and fuel economy. Stock Jaguar XE models can be equipped with a 247-horsepower 2.0-liter four-cylinder engine or a fuel-efficient 180-horsepower 2.0-liter turbodiesel. Married to an eight-speed automatic transmission, the gasoline-powered Jaguar will make 25 mpg in the city and 34 mpg on the highway. Diesel-powered variants make 32 mpg in the city and 42 mpg on the highway. Mercedes-Benz C-Class models counter with a 241-horsepower 2.0-liter turbocharged four-cylinder engine that is paired with a nine-speed automatic transmission. With this combination under the hood, the C-Class will make a lackluster 24 mpg in the city and 33 mpg on the highway. Drivers who want to pay up for the performance-tuned Mercedes-AMG C43 can add a 3.0-liter turbocharged V-6 or a 4.0-liter turbocharged V-8 for the Mercedes-AMG C63. Drivers who want to amp up performance in the 2018 Jaguar XE can add a high-output 296-horsepower 2.0-liter turbocharged four-cylinder power core that is paired with the eight-speed automatic transmission. Unrivaled thrills are a product of the 380-horsepower 3.0-liter supercharged V-6 that is a fixture on the Jaguar XE S spec sheet. Married to an eight-speed automatic gearbox, the Jaguar XE S will sprint from zero to 60 mph in just 5.1 seconds. Luxury and utility are highlights of the 2018 Jaguar XE spec sheet. With an impressive 15.9 cubic feet of cargo space, the Jaguar XE is perfect for day-to-day errands or family adventures. Standard Jaguar XE models deliver peerless luxury with premium Luxtec interior and an eight-inch Jaguar InControl Touch touchscreen that provides access to Apple CarPlay and Android Auto. Additional highlights include 17-inch wheels, Bluetooth, a sunroof, dual-zone climate control, driver-selectable modes, and much more.